A bad book description can kill your book sales. Why suffer needlessly? The price to attend this webinar is $79, which is an amazing deal. Why? Not only will I teach you the secrets of copywriting success, I will personally review your book description and send you specific feedback for improvement. It’s like an uber-webinar! However, at least 25 authors must register in order to hold this event. If we don’t get the 25 minimum, then the deal is off. You do love your book…don’t you? Most authors view a book launch like birthing a baby because of all the time, love, and effort put into creating it. If you love something that much, you want to give it every chance to succeed, right? Readers will think your book is boring and avoid buying it. Advertising money you spend driving people to Amazon will be wasted. Word of mouth will stall because people won’t have exciting language to use. You’ll lay awake in bed wondering why your book isn’t selling well. Your mother will be disappointed in your career choice. Boring book descriptions don’t stem for a lack of desire. Almost every author knows the importance of this issue. It’s a lack of knowing how to write effective marketing copy. I’m sure you were taught by your writing coach or editor how to write a book. But, describing your book requires a completely different approach. Most editors, publishers, and writing coaches don’t know how to write effective book descriptions. Otherwise, there wouldn’t be so many boring books displayed on Amazon. It’s like an epidemic of monotony. Only you can complete this task. You must make your book description amazing. No one else will. Otherwise, lame text will languish in front of readers forever, pulling down your sales potential. There is no neutrality when it comes to your book description. It will either help your sales, or it will hinder your sales. How confident are you that your text is effective? Unless you’re 100% confident with sales data to back it up, then I suggest you purchase access to my webinar on Wednesday, March 27th. 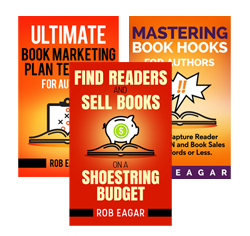 I’ll teach you the right principles and personally review your book description with specific tips for improvement. In case you think this newsletter article is just a sales pitch, allow me to drop some knowledge into your brain for free. Here’s what every author needs to know about writing book descriptions. Nobody cares what your book is about. Readers want entertainment, inspiration, or information. If your book description doesn’t communicate that these benefits await the reader, then I have bad news, amigo. You are losing more sales than you think. Seriously, stop right now and ponder how many people see your book description on a daily basis. A recent study I conducted with a large online retailer found that the average bestselling book is viewed over 50,000 times a year. That’s 137 times per day. Let’s be conservative and say your book only gets viewed 25 times per day. That’s still a lot of people, which represents a lot of daily sales. Look at it hypothetically. If 25 people see your boring book description every day, how many potential sales are you losing every 24 hours? 5 sales? 10 sales? All 25 sales? Even if you lose only 5 sales per day, that’s around 2,000 missed sales per year (5 x 365 = 1,865). By the way, this frightening math only applies to one book. If you have several books with boring descriptions, then the math could make you wind up in a fetal position crying in agony. Then, your mother would really be disappointed with your career choice. Let’s keep the mothers happy. On the other hand, if you’d rather get a root canal than write a book description, then allow me to help. You don’t have to struggle alone. Purchase access to my webinar. Don’t worry, I’ll record the material in case you can’t join the live instruction. P.S. – If you’re in the middle of working on your first book, don’t think that you get a pass. Don’t waste all of your effort writing a manuscript and then publish it with a boring book description. Wise authors learn how to write an effective book description while they’re writing their book. Thus, my upcoming webinar is for you, too.